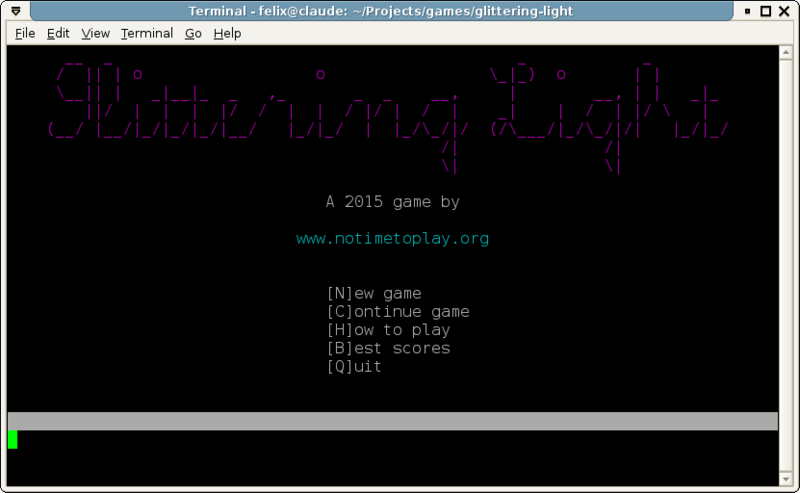 Glittering Light is a casual turn-based maze game that runs in text mode. That's marketing speak for "almost a rogue-lite, but not quite". 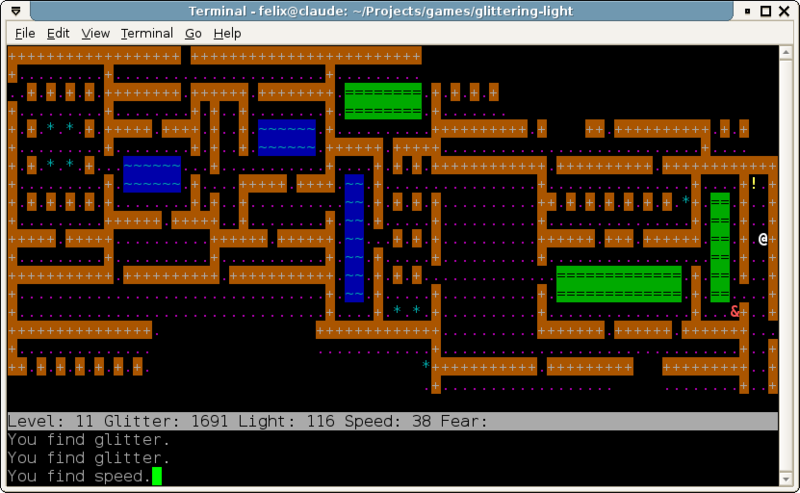 It was supposed to be more complex, but when it got to a playable state balance was already good enough. So I left good enough alone. For now you can get the game right here. It runs on Linux and Mac, but this time other versions are coming, so stay tuned. In the mean time, I have other gamedev-related news. This week, Boing Boing of all places ran an opinion piece called I'm Afraid to Die in Games, and it struck a chord with me. You see, way too many videogames are about fighting -- even cartoonish, family-friendly Super Mario Brothers. And that's a problem because fighting implies aggresivity, violence and the possibility of defeat. It's all fictional, of course, but it's a fiction we immerse ourselves in; that's why we play games in the first place. Maybe I'm just too old to take even simulated death casually, but in my games I make a conscious effort to avoid adding combat mechanics. Even so, I only succeed about half the time. Certain genres, such as shooters and roguelikes, revolve around combat by defintion. In others, it's a convenient mechanic to fall back on for lack of better ideas... or more development time. On a related note, over at the Rampant Coyote we have Jay Barnson explaining how in the original Dungeons and Dragons combat was the last resort, not the first, and character progression was tied to gold gathered -- a proxy for how much of the dungeon players had managed to explore. I knew that already, which is probably why in the three roguelikes I wrote so far you get XP for reaching a new floor, not for killing monsters (which are dangerous enough that you want to avoid them if at all possible). Not so heroic, perhaps, but a step towards rewarding alternate playstyles for those of us who are tired of conflict, however virtual. In other news, a site called Mental Floss posts a list of 15 things you might not know about Myst, and surprisingly enough some of the points where actually news to me. So, not bad. And for readers interested in retrocomputing, someone went ahead and designed a successor to the 33-year-old Commodore 64. Which is amusing to me because I occasionally indulge in imagining what 8-bit computers from the 1980es would have looked like today if PCs hadn't conquered everything. But that's just wishful thinking. See you next week.